FIREOn Friday afternoon last, a stack containing about 6 tons of Hay, belonging to Mr. E. Cox, of the New Inn, was discovered to be on fire. The Stack stood in a yard at the back of Mr. Cox's house. Some people who were on the spot rendered assistance, but it was not thought necessary to fetch the fire engine as there appeared no chance of saving the hay and there was no fear of anything else catching. It is supposed the stack was set on fire by children playing with matches as it could not have fired itself, it being two years old. NARROW ESCAPE OF FIREOn Thursday morning, the 20th inst., Mr. J. Middleton, jun, lighted his fire before going to work, leaving his wife in bed. About seven o'clock a neighbour had occasion to go to the house, when it was found to be full of smoke, and the couch in a blaze. The fire was extinguished before any damage was done to the other furniture. The house is one in a row of old thatched tenements, and if it had got hold a catastrophe to that which happened two years ago might have been the result. How the fire originated is not known, but it is thought that a spark flew from the fire on to the lining of the couch. NARROW ESCAPE FROM FIREOn Sunday evening a narrow escape from fire took place in Church-street, in a house occupied by Mr. Bates. It seems some fresh wood was placed on the fire, and the girl left in charge having occasion to go out for a time, during her absence some portion of the wood fell out on the hearth rug, burning a large hole in it, and damaging the cocoa matting beneath it. A shirt which was hanging by the fire was also burnt, more serious damage being prevented by timely help. The Pumpers at the fire will be paid at the Vestry Hall, Rushden, on Monday next, March 10th, from 7 to 8p.m. FireSome commotion was caused in High Street, about eight o’clock on Wednesday evening, by a report that a fire had broken out in a bedroom at the house of Mr C G Jowitt. A crowd quickly collected, and gazed eagerly at the smoke issuing from the window. It transpired, however, that by the use of buckets of water and hand grenades the fire was prevented from spreading, though not before some amount of damage had been done to the contents of the room and wearing apparel. The crowd quickly dispersed on learning that there was no danger of the outbreak spreading. A very instructive and interesting demonstration of the use of the “Emergency” fire extinguisher was given on Friday afternoon in Mr. Franklin’s grounds opposite the Victoria Hotel. Mr. Kenyon, the demonstrator, with the assistance of Mr. A. E. Patterson, of Rushden, had built a wooden structure seven feet high, with a large number of wooden rods and shavings packed inside. He then proceeded to saturate the pile with paraffin, afterwards setting fire to the shavings. When the wood was well alight and the heat so intense as to drive the spectators backwards, Mr. Kenyon took one of his tubes, about a foot and half in length and sprinkled the liquid contents over the blazing mass. The result was that within five seconds the flames had been extinguished. 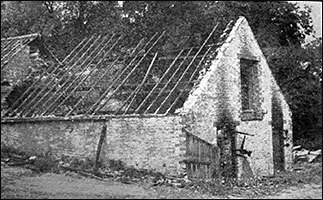 Captain F. Knight (of the Rushden Fire Brigade) was present, and expressed the opinion that the effect was remarkable, and that all mansions and detached places should be fitted up with the invention. 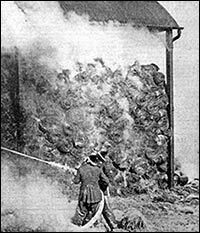 FireAn outbreak of fire occurred on Monday at the rear of the premises of Mrs Blunt, of the wool shop, High-street, some rubbish and shavings becoming ignited. Mr G R Turner and Mr J Whiting, of the Fire Brigade, were speedily on the scene of the outbreak, and the flames were put out without a great deal of damage having been done. A FIRE occurred in Newton-road on Monday evening about 6 o’clock, when a timber carriage, on which was a quantity of straw, belonging to Mr Wm Clayton, wood merchant, was badly damaged and the straw destroyed. We understand that Mr Clayton, having arrived at the hill near the allotments, had gone to the back of the vehicle to put on the brakes, when the front lamp ignited the straw, and in a few minutes the whole of the straw was ablaze. The horses were at once taken out but nothing could be done to save the straw, which was speedily calcined, the vehicle being badly charred. No little alarm was caused by the blaze, which lit up the sky, and at one time it was thought that the farm premises occupied by Mr Hornsby, dairyman, were involved, but happily this proved to be not the case. MR. C. WEBB'S motor cycle caught fire at 12.30 to-day near the Coffee Tavern, and there was a big blaze. A soldier, with a hand-squib succeeded in putting out the fire. On Sunday morning the Fire Brigade received a call to proceed to the old “Fever Hospital” Bedford Rod, where fire broke out. The call was received at 10.40 and the Brigade, under second officer Packwood made smart response, leaving the station with No. 1 steamer at 10.49. Upon arrival however, it was found that the tenant of the building, an employee of Mr. C.E. Knight, farmer, had secured the help of Mr. Rowe, the Urban Council’s foreman, who was on his allotment nearby, and succeeded in putting out the flames. The building, which is now used for ordinary domestic purposes, is matchboarded inside and the fire was caused by the heat from a flue pipe igniting some of the woodwork. A dangerous outbreak of fire was fortunately noticed by a Kettering motorist passing through Rushden just before 3a.m. on Sunday morning. As reported elsewhere he gave the alarm, and the Fire Brigade succeeded in saving the adjoining cottage, a stack of oats, a rick of hay and other property. The barn belonged to Mr. Jeremiah Knight of the High Street [South]. A TRIPE SUPPER was served to members and friends of the Rushden Fire Brigade on Friday last at the fire station. Capt. R. F. Knight presided, supported by Second Officer W. Packwood, Mr. C. W. Wing, Mr. A. Knight, and others. After on excellent supper, Mrs. Whiting being the caterer, a billiards handicap was held, the winner being Fireman Timpson, and the runner-up Fireman Bayes. Beams in an old house in Duck-street, occupied by Mr A King and his mother, got heated from the fire and gave off smoke. It was some hours before the trouble was found, being at 11.30p.m. on Saturday. Firemen Timpson and Whiting were summoned, and after an hour or two they were able to make the premises safe. They had to knock down a part of the ceiling. The Fire-Escape has been in frequent use this week, but fortunately not with the necessity of saving life. The handsome poplar trees in Spencer Park, having grown too tall and uneven, had to be lopped. The only safe means of reaching the boughs is by the Fire Brigade’s escape. FireThis morning the Rushden Fire Brigade received a call to a fire in Moor-road, Rushden, at 9.57. Second Officer Packwood and part of the brigade had left the station with the motor fire-engine in the quick time of two minutes from receiving the call. The remainder of the brigade, under Captain Knight, had left the station with the motor-tender in three-and-a-half minutes. A chimney was found to be on fire and had set the roof alight. The fire was extinguished by the “first-aid” tank, which is worked through the motor-pump. The brigade returned to the station in about an-hour-and-a-half. There were two outbreaks of fire in the vicinity of Wellingborough-road, Rushden, yesterday (Thursday) afternoon. The more serious was in the large field adjoining the Masonic Hall, where a blaze, which is believed to have started with a bonfire which got out of control, eventually raged over almost the whole field. The other outbreak was between the Oakley Inn and Sanders’ Lodge, where a hedge was ablaze for a short time. The Rushden Fire Brigade were called to the outbreak against the Masonic Hall, and were occupied for some time in difficult efforst to subdue the flames and smoke. Water was obtained from a road hydrant and several lengths of hose were run out. The fire, however, spread rapidly across the field away from the Hall and the gardens at the rear of houses in Park-avenue, though at one time it seemed as if the wooden fences adjoining might be threatened. The alarm, it is understood, was raised from Mr. G. S. North’s house, close by. ON FIRE - Rushden N.F.S. turned out at noon on Wednesday to the residence of Mrs. Hawkins at 8, Succoth-place. A battery under the floorboards near the bedroom fireplace had become ignited and caused the surrounding boards to catch fire. On arrival, however, the firemen found that the occupant had extinguished the fire with buckets of water. Â Awakened by a smell of smoke early on Monday morning, the occupants of No. 9, Spencer-road, Rushden, found that the front down-stairs room was ablaze. Â The N.F.S. arriving at 3.45, found that Mrs. Hart and a child had got out of the front bedroom window and were on the bay.Â They got them down by ladder and fought the fire successfully with first-aid apparatus, remaining over an hour.Â The fire did much damage to furniture, windows, curtains, cupboards, floorboards and a wireless set. Â Senior Company Officer A. P. Timpson was in charge of the firemen, and P.C. Skells also assisted. Over 100 tons of hay smoulder away as firemen fight a fire which started in a dutch barn at High Hayden Farm, Rushden, on Sunday. It went on for two days.